“​​​​Colony and Metropole” by Gene Ogle, Ph.D.
"​​​​Colony and Metropole" by Gene Ogle, Ph.D.
Ogle is Assistant Professor of History at John Cabot University in Rome, Italy. He is an expert on the Atlantic world and is writing a book on race, violence, and honor in Saint Domingue. 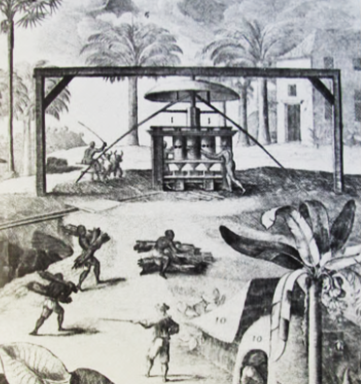 During the last half of the eighteenth century, Saint Domingue became France's most important colony and an object of envy for other European imperial powers thanks to the development of its remarkably productive plantation economy. As shown in the table below and to the left, by the 1780s the colony was a massive exporter of sugar and coffee along with other commodities, and imported tremendous quantities of French merchandise and French-traded African captives. According to some estimates, by that decade the colony received 2/3 of all French overseas investments, and its annual exports were worth somewherebetween 150 and 170 million livres tournois--for 1789, the year for which this table was drawn up, the value was reckoned to be 162,994,367 livres. To put this into perspective, during the 1780s a skilled worker in France earned about 500 livres per year. 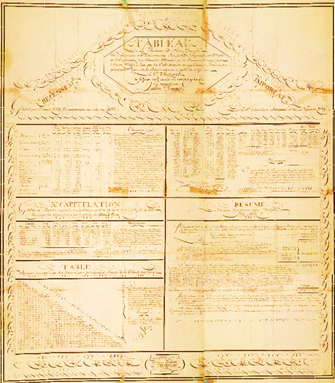 During the same decade, based on the Trans-Atlantic Slave Trade Database, the colony received approximately 27.3% of allAfrican slaves (192,494 out of a total 706,400) transported across the Atlantic Ocean, and while some were smuggled in from non-French sources, the great majority were transported by French slavers. As such, Saint Domingue was a primary source of the increasing prosperity of French Atlantic ports such as Bordeaux and Nantes, and indirectly of the French economy as a whole. 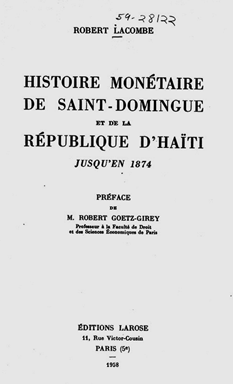 If colonial trade bound France and Saint Domingue to one another, the economic relationship between colony and metropole was also a major source of discord. As a result of the risks inherent in producing agricultural commodities for unpredictable markets combined with the need for high levels of capital investment to keep plantations functioning, planters tended to fall heavily into debt to metropolitan merchants. In turn, those merchants had difficulties reclaiming these debts--royal legislation aimed at keeping plantations intact (and as such profitable over the long run) made foreclosure all but impossible. Further, the colony faced a chronic shortage of specie which could not be met through trade within the French empire, as the prominent place of Spanish coins in the photograph to the left makes clear. Most significant, however, were divisions between colonial interests and metropolitan ones regarding the exclusif, or the Crown's attempts to prevent, and after a very moderate liberalization of foreign trade in the 1780s, limit, trade with non-French merchants. Throughout the eighteenth century, colonists unsuccessfully attempted to convince the French monarchy to abolish the exclusif, even at times pushing protest over this and other matters to outright rebellion. This periodic turn to rebellion points towards another important feature of the imperial relationship--since the French Empire was ruled, at least in theory, by an absolute monarchy, there simply was no legitimate political space for contesting imperial policy.